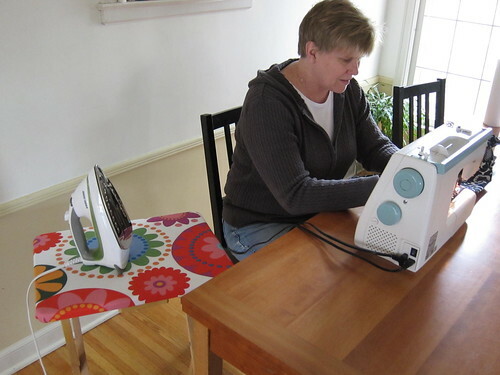 One day not too long ago, I was over at Jenny‘s sewing up some Project Project Runway designs when I noticed her ad hoc ironing board. She would set up a wooden tv table next to her chair, cover it with a towel and was able to iron away without standing up or filling her whole dining room with a huge ironing board. 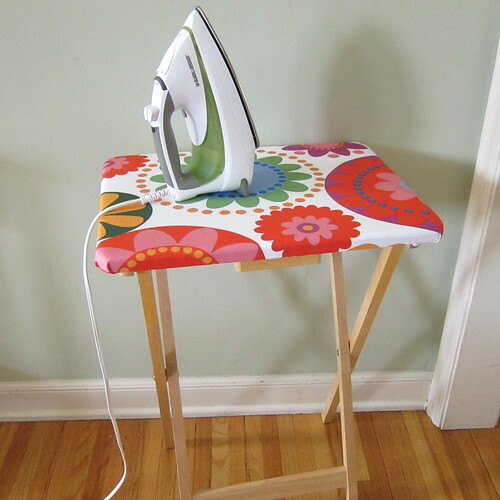 I thought why not take it one step further and cover the top of the tv table to make it into a true ironing board. This is a quick and easy project that will take just an hour or so to complete. The end result is so useful. 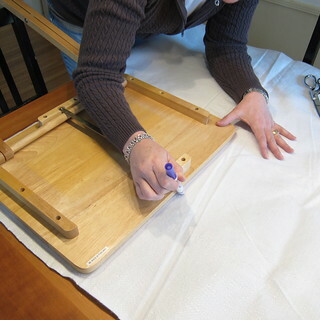 It’s perfect for small crafting spaces like mine that don’t have room for a full-sized iron board, but gives you a lot more ironing space than those tiny craft ironing boards. When I’m quilting or need to press open a seam the iron is right there next to me so my workflow doesn’t get interrupted at all. 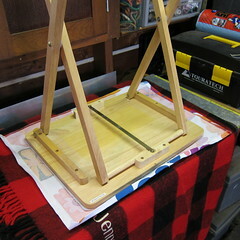 Then when I’m done the ironing board gets folded up and stored away until needed again. I love it! Just a note about the supplies for this project. We picked up the foldable tv tables at Target for $10. 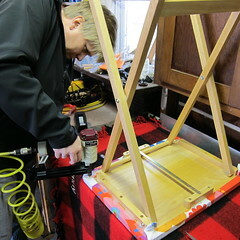 Jenny’s husband saw this project as an excuse to get a pneumatic stapler, but any staple gun with strong staples should work. It may just take a little more hand strength. 1. Lay the batting out and put the table top on it. Trace around the edges with a pen. Cut it out. Since you want it to just cover the top, you’ll want to cut right inside the tracing line. 2. 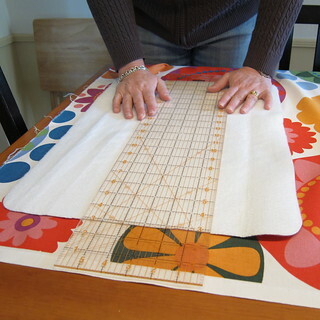 Lay out your fabric and place the piece of batting on top of it. Cut the fabric so it is about 3″ bigger all the way around than the batting. It’ll look like a lot extra, but you’ll need the extra length. 3. 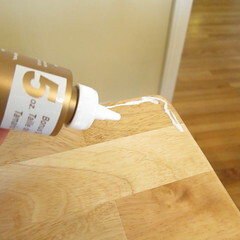 Glue the batting to the top of the table. You are just looking to keep it in place so you don’t need to go crazy with the glue, around the edge with just a few stripes in the middle is fine. 4. Lay your cut piece of fabric out with wrong side facing up. Center the table on it. 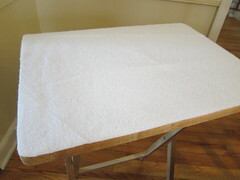 On one side of the table, fold the raw edge of the fabric under and then fold the fabric around the table edge. 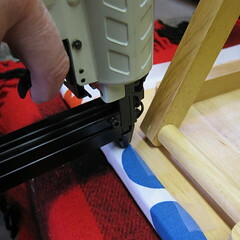 Use tape to hold the fabric in place on the table. 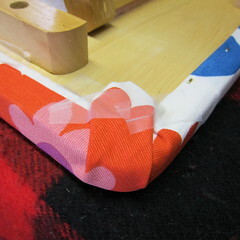 The tape will help you hold the fabric taut and keep your fingers away from the stapler. 5. Staple the fabric on that first side down. We put in a staple about every inch. 6. Now do steps 4 and 5 on the opposite side of the table. Make sure to pull the fabric taut. 7. Now you will do the two other sides and the corners. You will do the length of each side the same way, but you will have extra fabric that needs to be folded up at the corners. We found it was easiest to fold this fabric up before stapling in final sides. 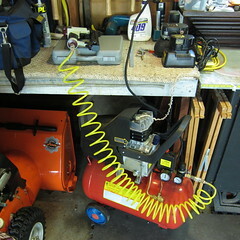 You can get fussy and do super neat tight corners. Since this isn’t a piece of furniture we were upholstering, we didn’t worry about it too much. 8. 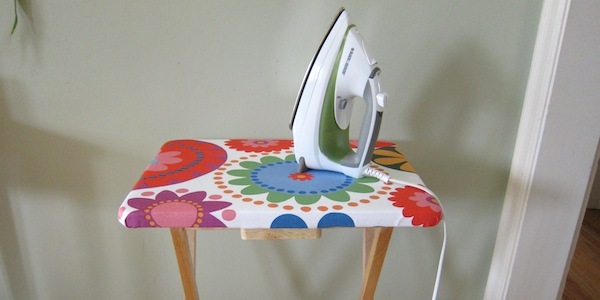 Remove the tape and you have a new ironing board to stand by your side wherever you need it. 7 years ago by Kat in Craft Projects , Crafts , Projects | You can follow any responses to this entry through the RSS feed. You can leave a response, or trackback from your own site. Great project. Also–great excuse to get a new staple shooter. Brilliant. I have a small sewing space, and hate to lug out the board. This is definitely on my to-do list. Thank you for sharing! I have a TV tray that I’d been thinking of doing this to for a while. Maybe this weekend would be a good time for it! I got ours from Habitat but that was 20 many years ago. Don’t understand if they still do them. I saw something similar to this on another blog and wanted to make it. Thanks for the encouragement, it will work perfectly in my sewing room. 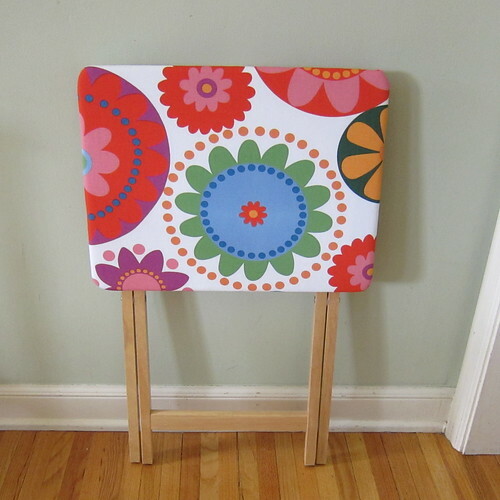 I have one of these IKEA table top ironing boards: http://www.ikea.com/gb/en/catalog/products/50119054/ It works perfectly for me because I have counter space it can sit on, but I don’t have space for a free standing board or table. 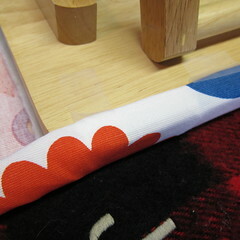 It does need a pretty new cover, though – and I have some of that exact fabric I could use! 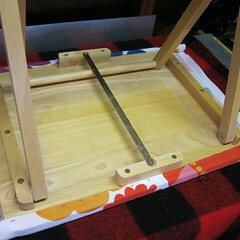 Also, looking at this, you could easily make an ironing board cover to fit the table, if you didn’t want to glue/staple. 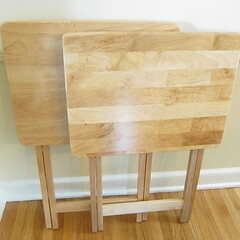 And how exactly would you do that – you wouldn’t be able to fold the table if you need additional room. If you look at the step-by-step instructions you can see we only cover the top. The legs are still free to fold flat. Mine is folded away right now. So if you made a cover that had elastic edges it would be the same thing, it would just go around the top. Is the heat resistant batting placed with the silver side up or facing the table? I’ve seen one of these and now I can make my own. Thanks so much for the supplies and directions. I think you want the silver side up so it reflected the heat up & away from the table top. Glad to here it! This has been a very popular project. Would it be possible to sew the batting in place and put an elastic piece around the edge and slip it on the table top rather than staples? I’m sure it would, with some good measuring. There were not tables we wanted to use for anything else and were going for the easiest method. what brand of batting are you using and where on the package does it say “heat resistant?” Also, where can I get this? Joanna? Hobby lobby? Price? Bolt or packaged? We used Insul-Bright Mylar/Poly Batting, it says right on the front of the packaging that is reflects back heat and cold and is good for things like potholders. We got it at Joann. We bought it is a package, though some places may have it by the bolt. On our supply list, it is a link and also take you to a listing for it on Amazon, where it is $4.39 a yard. Thanks! By the way is that a Kenmore model 385? I have three of them and love them all!